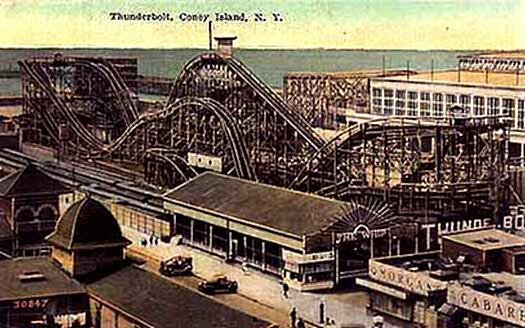 Coney Island was home to Sea Lion Park, the first enclosed amusement park, which opened in 1895. 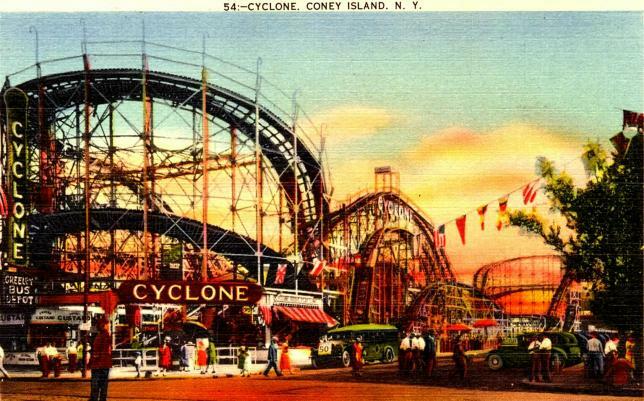 Coney Island became famous for having several of the best-known amusement parks in the world. 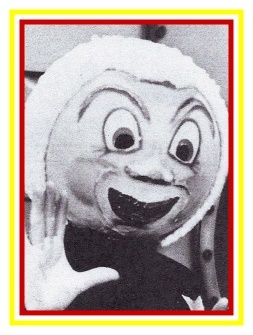 There was Steeplechase Park, Luna Park and Dreamland. In addition, a person or group of persons would lease space for single attractions. 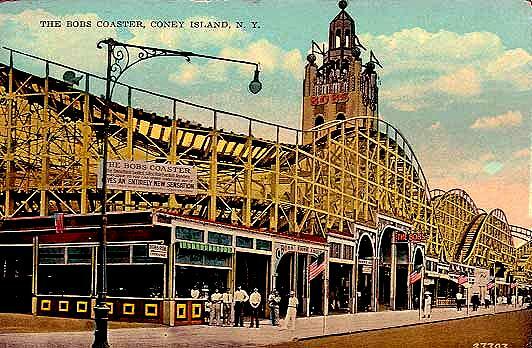 Coney Island was described as the “Poor Man’s Paradise.” It also became the “Nickel Empire”, where for a nickel, you could get a hot dog or a knish (deep-fried baked potato cake), or ride on any of the thrilling amusements. 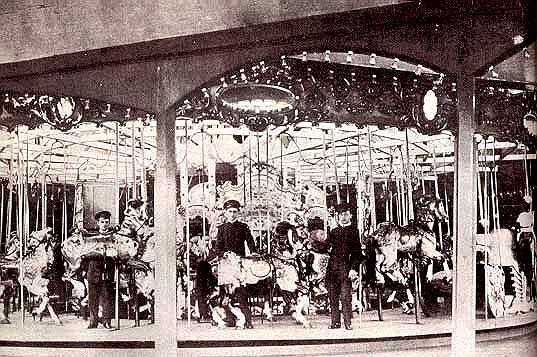 Famed artisan Charles Looff created Coney Island’s first carousel in 1875. 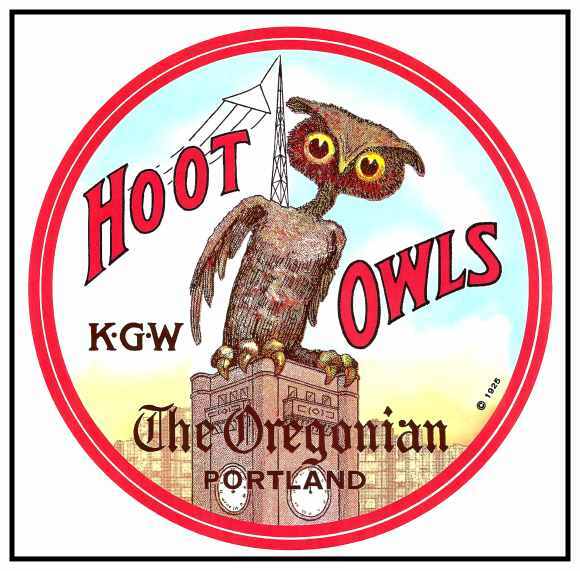 He carved many of the animals himself and it operated with steam power. Built for the Philadelphia Centennial Exposition, a 300-foot Iron Tower was moved to Coney Island in 1877. 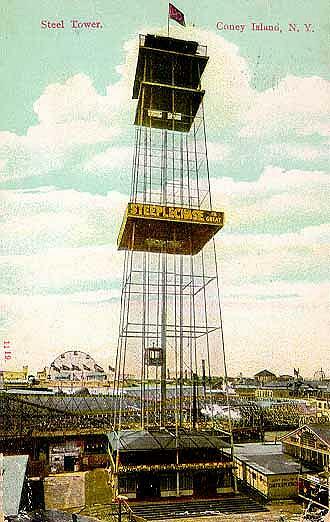 Two steam-operated Elevators transported visitors to the top of the 300’ Iron Tower where they could see splendid views of Coney Island and surrounding areas. 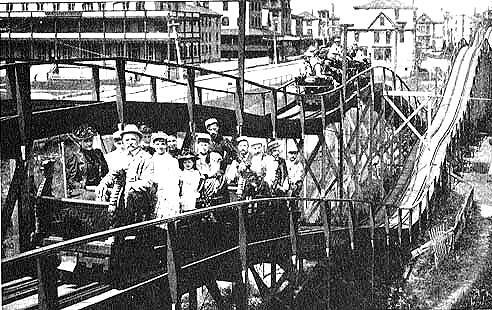 Lamarcus Thompson, who also built many of the rides at Portland’s Council Crest Park, built one of the world’s first roller coasters, his Switchback Railroad, in 1884 at Coney Island. 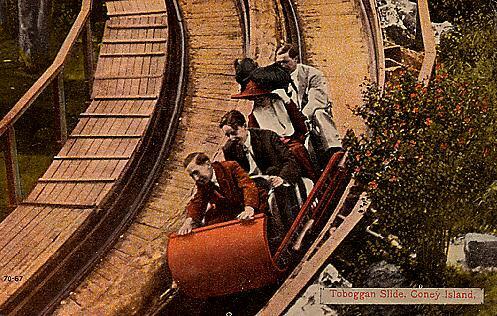 World’s first Roller Coaster, Switchback Railroad built by L.A. Thompson in 1884. 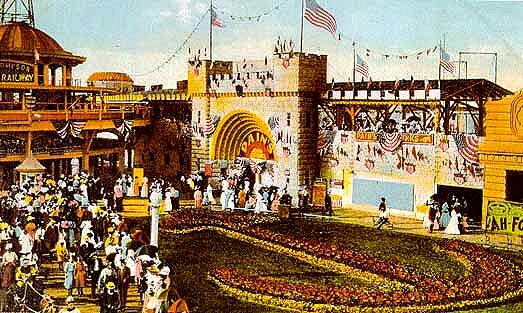 In 1895, the first enclosed amusement park, Sea Lion Park, opened at Coney Island. Rides included a Shoot-the-Chutes water slide, an Old Mill Ride and a Sea Lion Show. Poor weather and economic problems forced the closure of Sea Lion Park in 1902. 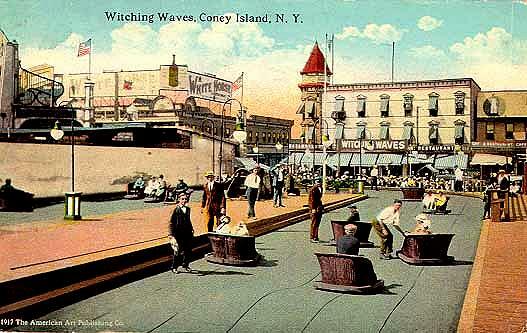 In 1894, George Tilyou erected Coney’s first Ferris Wheel at the Bowery, near the Iron Tower. 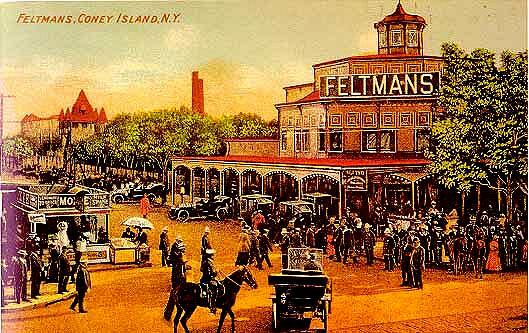 He also built several other attractions scattered around Coney Island. 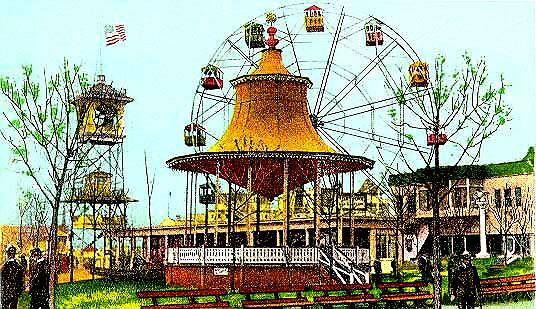 In 1897, he consolidated his rides into one place by the Ferris Wheel and opened Steeplechase Park. George Tilyou’s Ferris Wheel at Coney Island had 12 cars that each held 18 passengers. 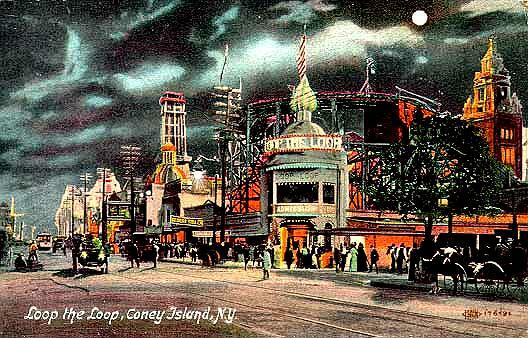 Partners Frederick Thompson and Elmer Dundy built the Trip to the Moon for Steeplechase in 1901 and two years later, Trip to the Moon was the centerpiece of their newly opened Luna Park. The next year, in 1904, Dreamland was opened by former State Senator William Reynolds to record crowds and the theme was “bigger and better”. 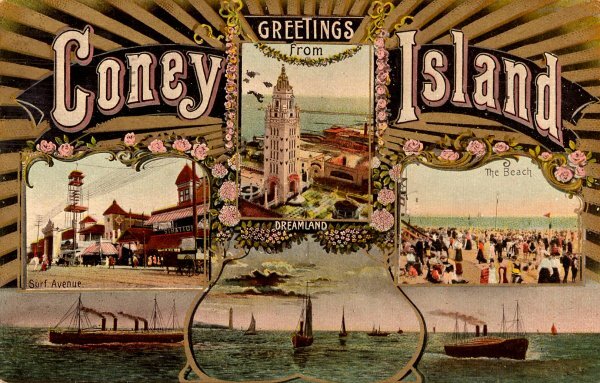 The following post cards are “generic” to Coney Island. In some cases, there is no information about their location at Coney Island. Some simply were not identified and in other cases, there would be enterprising showmen who would have a ride or two and lease space from the property owner. Many times that was how the most successful showmen got their start. 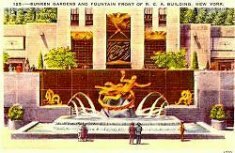 There were a number of famous Circuses and Acrobatic Troupes. Night view of the Loop the Loop. The Cyclone opened in 1927 and you can still ride the Cyclone today, with its 90-foot drop-off. 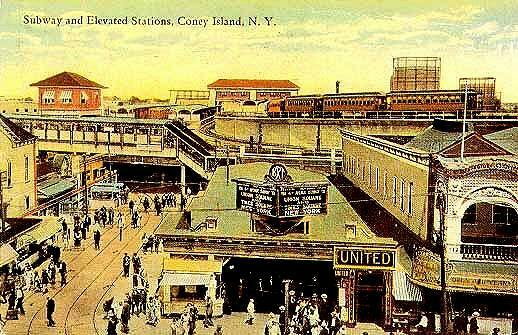 The train station at Coney Island shows several levels. The subway ran on the lower level and elevated trains rode on the upper levels. 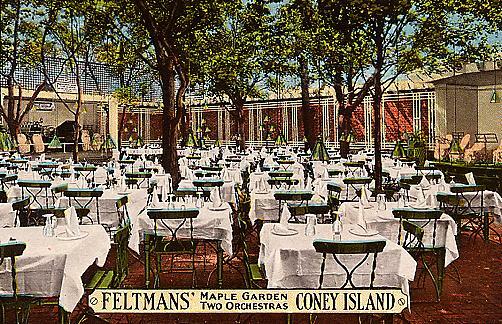 Feltman’s Restaurant – the birthplace of the hot dog. Interior of Charles Feltman’s Maple Garden. Stauch’s Restaurant opened in 1879. 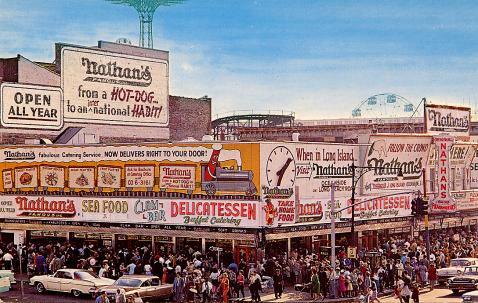 Nathan’s, the world’s largest hot dog stand, as it looked 50 years ago. Each year, they hold the World Champion Hot Dog Eating Contest. A modern park, Astroland, opened in 1963 and it closed in 2008. A few other rides still operate during the summer or on weekends. 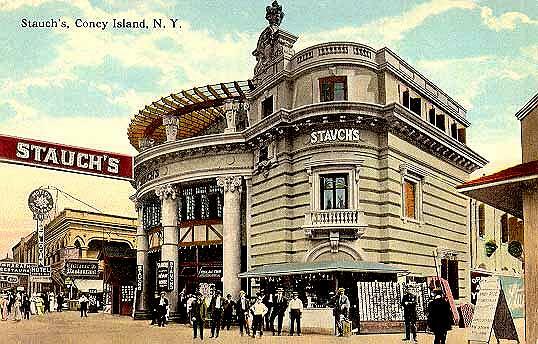 On a single day in 1906, the post office at Coney Island postmarked over 200,000 post cards.